We begin our online Ignatian Prayer Adventure by reflecting on God’s unconditional love for each of us. Then Days 3 and 4 introduce a theme that will recur often: the importance of achieving spiritual freedom. The week ends with three days of reflection on the First Principle and Foundation, St. Ignatius’s meditation on the purpose of life. The Anima Christi (“Soul of Christ”) was a popular prayer in Ignatius’s day. 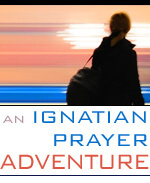 Ignatius does not include the prayer in the original text of his Exercises, but he does refer to it several times. Many later editions of the Exercises include this prayer at the beginning. It serves to remind us that Jesus Christ is central to the Exercises. We begin the retreat by reflecting on God’s faithful, unconditional love for each of us. We consider who we are most fundamentally—or rather, Whose we are. Each one of us is God’s beloved son or daughter: this is the core of our identity. I pray for the following graces: to be more aware of how God is near; to trust in God’s personal care and love for me. Pray slowly over the verses. What words or images move you? Consider: Who is God for me? How does God see me? Prayer has far more to do with what God wants to do in us than with our trying to “reach” or “realize,” still less “entertain,” God in prayer. This truth eliminates anxiety and concern as to the success or non-success of our prayer, for we can be quite certain that, if we want to pray and give the time to prayer, God is always successful and that is what matters. . . . What we think of as our search for God is, in reality, a response to the divine Lover drawing us to himself. There is never a moment when divine Love is not at work. . . . This work is nothing other than a giving of the divine Self in love. The logical consequence for us must surely be that our part is to let ourselves be loved, let ourselves be given to, let ourselves be worked upon by this great God and made capable of total union with Him. Consider: How does God gaze upon me? How open am I to receiving this intimacy? As we enter into the Spiritual Exercises, we retreatants find ourselves sometimes doing much thinking and reasoning things out. At other times, we experience far more the response of our hearts, with little or nothing for the head to be concerned about. It is good to remember that we are always in the context of prayer, whether the prayer is more meditative or affective. We should always try to maintain a spirit of deep reverence before God, especially when our affectations are involved. [However,] we have numerous preoccupations that get in the way of our hearing and responding to God’s call: fears, prejudices, greed, the need to control, perfectionism, jealousies, resentments, and excessive self-doubts. These tendencies bind us and hold us back from loving God, ourselves, and others as we ought to. They create chaos in our souls and lead us to make poor choices. Lacking spiritual freedom, we become excessively attached to persons, places, material possessions, titles, occupations, honors, and the acclaim of others. These things are good in themselves when ordered and directed by the love of God. They become disordered attachments when they push God out of the center of our lives and become key to our identity. I pray for the following graces: to grow in interior freedom; to become more aware of disordered attachments that get in the way of loving God, others, or myself. Pray over the story of the Annunciation and marvel at Mary’s freedom to say, “Yes!” Notice how she deals with her fears and keeps her focus on God. Pray over the words of the Gospel slowly, meditatively, or use your imagination to place yourself in the scene. Pray for St. Paul’s single-minded and single-hearted focus on Christ. Ask: When have I experienced or witnessed such focus, such freedom in my life? We always need to pray for more spiritual freedom; we cannot become free on our own. Holy desires are at the core of the first key meditation of the Exercises, the Principle and Foundation. It reads like a mission statement for the human person: “I am created to praise, love, and serve God.” Of course, this vocation is specified in each unique human life. When we live out of this vocation, we are truly happy and fulfilled. When we allow disordered loves and self-preoccupations to clutter our lives, we find ourselves out of balance, unhappy, and discontented. The grace we seek is indifference. In Ignatian vocabulary, this term does not mean an unfeeling lack of concern. Instead, indifference means that we hold all of God’s gifts reverently, gratefully, but also lightly, embracing them or letting them go, all depending on how they help us fulfill our vocation to love in everyday, concrete details. I pray for the following graces: a deepening awareness of my fundamental vocation to praise, love, and serve God and others; a desire for greater indifference in my life; a willingness to embrace who I am before our loving God. Prayerfully read the traditional translation of the Principle and Foundation. Ask: How do I concretely praise, love, and serve God? What activities, people, or material things help me achieve this end? It is true to say that for me sanctity consists in being myself and for you sanctity consists in being your self and that, in the last analysis, your sanctity will never be mine and mine will never be yours, except in the communism of charity and grace. For me to be a saint means to be myself. Therefore the problem of sanctity and salvation is in fact the problem of finding out who I am and of discovering my true self. Indifference is another way of describing spiritual freedom. It is a stance of openness to God: we look for God in any person, any situation, and any moment. Indifference means that we are free to love and serve as God desires. Spiritual freedom or indifference is a gift from God; we can’t make it happen. But we can, over time, foster indifference by developing good habits of thinking, choosing, and acting. Consider it an invitation for you to experience more deeply how intimately related you are to God and to all of God’s creation (including persons, other creatures, and the natural world). In so doing, certain fundamental truths about our existence come alive: God creates me out of love, in a particular time and place, with particular talents and temperaments, strengths and limitations. God continues to create and to reveal who God is to me and who I am before God. God invites me to partner with God to build a more just and gentle world. I learn that the best way to praise God is to be who God made me to be and to honor the uniqueness of other creatures. Prayerfully read the contemporary translation of the Principle and Foundation. Ask: How have I been a “good steward” of the gifts God has given me, including created things, my talents, and my abilities? From my own experience, what gets in the way of my praising, loving, and serving God? How do the following influence my choices and actions: titles, honors, possessions, career, opinion of others, lifestyle? Be as concrete as possible. Consider how God calls Moses to partner with God in the work of liberation: “I will send you to Pharaoh to bring my people, the Israelites, out of Egypt.” Reflect on your own life: How have I partnered with God to help people, to build a more just and gentle world, to care for creation?